On Tuesday, a humanitarian flotilla from the Gaza Strip was stopped nine miles from the shore of Gaza by the Israeli navy. The boat was seized, and its passengers returned to the prison of the Gaza Strip. Update: The Israel Navy released the passengers of the humanitarian flotilla, after transferring them to Beit Hanoun (Erez) terminal, in northern Gaza. According to Maan News Agency, the passengers, including the captain’s assistant Mohammad al-‘Amoudi , and a wounded, wheelchair-bound young man, identified as Ra’ed Adeeb, were released. It added that the only person who remained imprisoned by Israel is the ship’s captain, Soheil al-‘Amoudi. In total, the ship carried eighteen Palestinians, including one woman four wounded Palestinians, and four cancer patients, who were taken prisoner when the navy intercepted the flotilla, after its sailed 14 nautical miles. The attempt to break the blockade comes two weeks after ‘Bloody Monday’, when Israeli forces opened fire on unarmed demonstrators at the Gaza border with Israel, killing 60 and wounding more than 700. That protest was on May 14th, 2018, the day chosen by U.S. President Trump to open his country’s new consulate in Jerusalem – essentially denying the internationally-recognized right of Palestinians to live and own property in their city. According to the Israeli online magazine +972Mag, the boat that was intercepted was headed to Limassol, Cyprus, and was part of a small flotilla comprised of three boats in total. The two other boats turned back and did not breach the naval blockade line enforced by the Israeli military. The boat that the Israeli military intercepted was carrying 18 people. Those on board were mainly university students, but also included cancer patients and protesters wounded during the Return March seeking medical care outside of the besieged Gaza Strip, flotilla participants said. “We are two university graduates, we lost hope of finding work in Gaza. Life in Gaza is impossible. We want a secure future. We are leaving for the sake of freedom,” flotilla participants Shadi al Nakleh, 28, and Ihab abu Armaneh, 29, told +972 correspondent Mohammed Zaanoun. 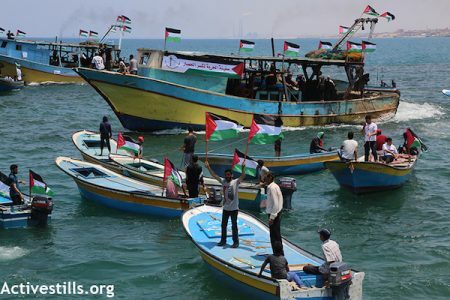 According to israelpalestinenews.org, under the Oslo Accords signed in 1993, Israel is obligated to permit fishing up to 20 nautical miles, but this has never been implemented.The widest range Israel has allowed boats in the past 10 years is 12 nautical miles (22km), and at times, the limit was reduced to one nautical mile (1.85km). Although hundreds of people boarded more than 30 fishing boats in support of the main vessel, they did not cross the six-nautical-mile permitted boundary, Ramadan al-Hayek, one of the organisers of the voyage, told Al JazeeraFifteen boats attempted to cross more than nine nautical miles (16.7km) but met open fire by Israeli forces. These boats sailed in a show of support and were not aiming to reach Cyprus, al Hayek added.Organisers of the voyage, called Break the Siege committee, also told Al Jazeera the captured boat went as far as 14 nautical miles (26km) when Israeli forces started shooting towards the vessel.They lost contact with those on board shortly after that. According to al-Hayek, 17 people were detained by Israeli forces in Ashdod.Committee members said they were working with international agencies, including Human Rights Watch and The International Committee of the Red Cross (ICRC), to ensure the wellbeing of the boat’s passengers and to hold Israel responsible for their safety. Al-Hayek also said the committee would soon announce the launching of a second boat in response to Israel’s actions.The Israeli military blamed Hamas, the party governing the Gaza Strip, for the naval “breach”.